In this part of The Book of Mormon there are several small, one chapter books, including the book of Enos that I covered in the last episode. In the last episode I neglected to mention that in the original publication of The Book of Mormon, the book of Enos talks about King Benjamin, and in the later editions changed it to king Mosiah. This episode starts with the book of Jarom, which is scarcely worth mention other than he makes mention of steel in verse eight, and as I have made abundantly clear in past episodes that steel was not known or used by anyone anywhere in the America’s until after the European colonization. It is also mentions in this book that they follow the law of Moses and had priests, but the law of Moses only offered the priesthood the descendants of Levi, and these people were supposed to be from the line of Joseph and could not have legitimately held the priesthood. The book of Omni is not really worth mentioning and The Words of Mormon is just an explanation as to where all of the different books within The Book of Mormon supposedly came from and how Mormon compiled them. It gets interesting again when we get to the book of Mosiah, and there is a lot to cover in that book, so without any further delays, we will examine the book of Mosiah. In the first few verses of Mosiah it talks of the brass plates that Nephi got from Laban before they left the Holy Land, and it says that if they did not know the language of the Egyptians they would not have been able to read the brass plates and to teach the word of God that was written on them to their children. The problem I have always had with this is that the brass plates were supposedly the Torah inscribed on brass pages that were in the possession of a man named Laban who was a leader among the Jewish people in Jerusalem. The Torah was traditionally written on scrolls, but there is some evidence that the people in this region did sometimes use lead or other material to write on and it is not the brass pages that I really have the issue with. What I have an issue with is a leader of the Jewish people teaching other Jews the laws from the Torah, written in Egyptian, the language of an idol worshiping people. It is also a tradition among the Jewish people that, while you can read the Torah written in other languages, such as English, when you study it or teach it you have to do so from the original Hebrew language. It is true that when the Jewish people were in captivity or scattered they would often be forced to learn and write the language of their captors, but the law of Moses and the Torah were not written until after the children of Israel left captivity in Egypt and were free to speak and write Hebrew, the language they view as holy above all others, so in a situation where they were free the thought that they would have ever written holy scripture in the tongue of an idolatrous people, especially that of a people who made their very existence nearly unbearable for five hundred years, is absolutely ridiculous. In verse six of the first chapter of Mosiah it talks about how they could know for a surety that the engravings were true because they had them before their eyes, which is yet another reason why, if the golden plates were real and of God, they should have been made available to the world so that everyone could know they were both real and true. If the golden plates were real and available for examination they would have gone through the same rigorous examinations the Bible has and would have been validated. 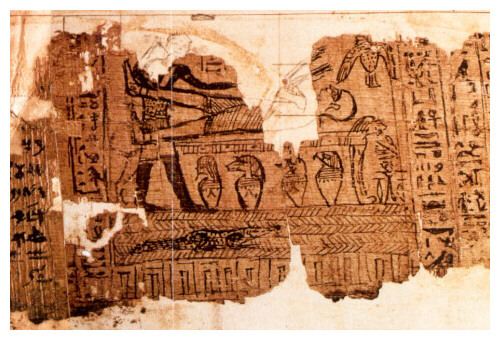 The story that the angel took them to heaven instead of allowing them to remain on earth does not make any sense unless either there were no plates or they did not say what Joseph Smith said they did, like the papyrus that he said he translated the book of Abraham from. I plan on having a series on the Pearl of Great Price at some point, including the book of Abraham and its origins, but for those of you who may not be familiar with its origins, I will briefly explain the controversy with the book of Abraham. When the saints were living in Illinois a man came through selling Egyptian mummies, and Jospeh Smith discovered that there were ancient scrolls with them and offered to buy them, but as the salesman was eager to just get it over with and go home, it was an all or nothing sale and in order to get the scrolls Smith had to buy the mummies as well. The asking price, nearly three thousand dollars, was an exorbitant rate for the time, but Joseph somehow managed to raise the money from his followers in order to buy the mummies and the scrolls. At this time the saints were struggling financially as they were also giving more than they could afford to build the temple and they were also financially supporting Joseph Smith and his family. Joseph Smith said he translated the ancient writings and discovered that they were the writings of Father Abraham and even wrote in his journal that he was translating the scrolls. Smith went so far as to write an Egyptian alphabet and translation. At this time the Rosetta Stone had just recently been discovered and had not yet been translated and there was no one alive who could read Egyptian so when Smith claimed to translate the Egyptian language people were understandably impressed. Fast forward a few years and Joseph Smith had been murdered while imprisoned in Carthage, IL where he was being held while awaiting trial using his authority to wrongly destroy a privately owned printing press, for treason against the state of Illinois, and for a host of other crimes, charges that he would have undoubtedly been convicted for had he lived long enough to stand trial. A lot of the locals had had enough of Smith and his scheming and organized a lynch mob and broke into the prison where Smith was being held while and murdered him along with his brother Hyrum. 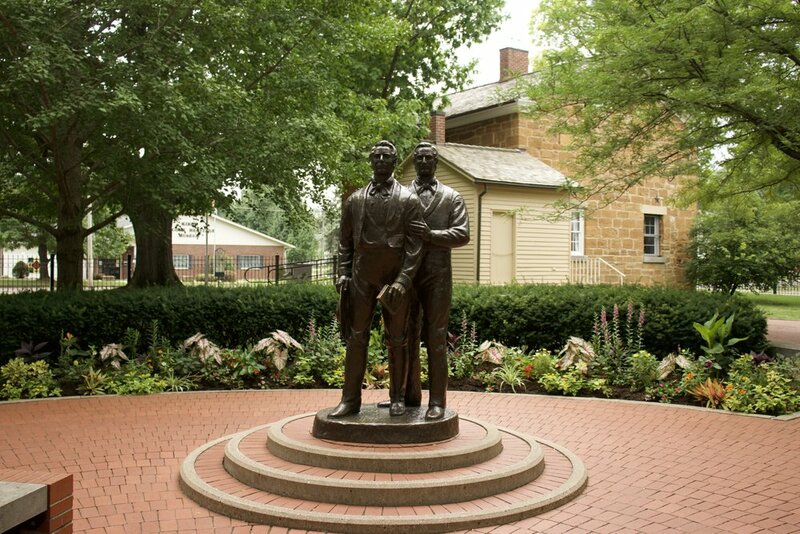 It wasn’t long after Joseph Smith and his brother were killed that the rest of the Church was forced to either abandon the teachings of Smith that did not conform to the standards of morality and decency in the community and to the laws of the land or to leave the state. The majority of the church opted to follow the next president and claimed prophet of the church, Brigham Young, to Utah, but many stayed in Illinois as well, including Emma Smith, Joseph’s first wife, and his mother, Lucy Mack Smith. Emma Smith kept the scrolls in her possession instead of allowing the church to have them and later sold them, with a letter of authenticity, certifying they were the same scrolls her husband used to translate from to write the Book of Abraham. It was believed the scrolls were destroyed in the great Chicago fire, so later, when Egyptian could be read and translated they were no where to be found and all we had to go by was the facsimiles in the Pearl of Great Price and the Church was quick to make the claim that it was neither fair not accurate to translate from a copy and not the original. Some time later the scrolls, along with the letter of authenticity from Emma Smith, were found in the attic of a museum and offered to the Church who was understandably glad to get them; now the Church could prove once and for all that Joseph Smith was a true prophet and translated an ancient scripture, only that is not the consensus Egyptologist came to, not even those who were members of the Church. As it turns out, the scrolls had exactly diddly and squat to do with anything smith said they did, and instead of being the record of Abraham they were just common burial scrolls. Church apologist have since tried to say that the book of Abraham was received through vision and that Smith did not claim it to be a direct translation, but since Joseph Smith said in his own journal that he was translating the scrolls and they were the writings of Abraham, as they say in the south, that dog don’t hunt. Anyhow, now that I have gone down that rabbit hole I will get back to Mosiah. There are issues in the book of Mosiah that were also present in the earlier books I covered so I will skip them in this episode as to not be redundant. Some of those issues are claiming to follow the law of Moses while offering sacrifices that are not approved or done in a way forbidden by the law of Moses, tribes other than those from the tribe of Levi having the priesthood, animals, plants and materials mentioned that were not present in any of the Americas during The Book of Mormon time period, etc. Mosiah 2:21 says that everything we have comes from God and that nothing we do, even if we give it our all, will ever amount to much and that we can’t earn what God gives us. “I say unto you, my brethren, that if ye should serve him who created you from the beginning, and is preserving you from day to day, by lending you breath, that ye may live and move and do according to your own will, and even supporting you from one moment to another-I say, if ye should serve him with all your whole souls yet ye would be unprofitable servants.” With verses like this it baffles me that the church officially teaches that we can not only earn our way to heaven but can accrue enough good works to become a god. It is interesting that during a discussion with an investigator on my mission I read Mosiah 2:21 and my mission companion protested, and once we were alone he said he did not like the way I used verses like that because it made me sound like a born again Christian. I never really understood it, but Mormons think it is a horrible thing to be born again. Verses 23 through 25 of Mosiah chapter 2 goes into great detail of how we owe everything to God and that our meager works don’t amount to anything and that we can’t earn the grace of God. In Mosiah 2:33 it says, “For behold, there is wo prenounced upon him who listeth to obey that spirit; for if he listeth to obey him, and remaineth and dieth in his sins, the same drinketh damnation to his own soul; for he receiveth for his wages an everlasting punishment, having transgressed the law of God contrary to his own knowledge.” So what about proxy works for the dead? I know that Mosiah was speaking mostly to believers, but even even those who do not believe in any church and sin know that they are living contrary to the will of God, and based on this verse, once they die there is no hope for redemption or salvation. Mosiah 3:8 gives us four of the many names that Jesus will be called, “Jesus Christ,” “the Son of God,” “the Father of heaven and earth” and “the Creator of all things from the beginning.” This verse mostly says what John 1:1 says, which is that Jesus is God and has always been God and that everything that is in existence was made by him, including matter. Mormonism teaches that God created us and Jesus out of material that existed as long as he did, probably created by a god eons before he existed, and that not even God can created or destroy matter and can only reorganize it. Christianity, and apparently The Book of Mormon, teaches that Jesus was not only not created but that he created all things from the beginning, including matter and the devil. This verse alone tells us that there is no way that the devil is the brother to Jesus like LDS doctrine teaches because Jesus created the devil. The official missionary training manual that I was given on my mission (and several of the priesthood/relief society manuals) says we can’t enter the celestial kingdom without the consent of Jospeh Smith, but Mosiah 3:17 says otherwise, “And moreover, I say unto you, that there shall be no other name given nor any other way nor means whereby salvation can come unto the children of men, only in and through the name of Christ, the Lord Omnipotent.” If Joseph Smith is to have any say as to whether or not we enter heaven than there is another name given other than the name of Jesus. When I was on my mission I would teach that all have fallen short of the glory of God and that we are all basically worthless sinners, and I was reprimanded for doing so because that goes against the doctrine that we are gods incarnate. However, The Book of Mormon disagrees with the god embryo doctrine and agrees with the Bible that we are worthless and fallen sinners who can do nothing of ourselves. “For behold, if the knowledge of the goodness of God at this time has awakened you to a sense of your nothingness, and your worthless and fallen state—“ (Mosiah 4:5). Mosiah reminds us again how worthless we are in verse eleven. Mosiah says, “And this is the means whereby salvation cometh. And there is none other salvation save this which hath been spoken of; neither are there any conditions whereby man can be saved except the conditions which I have told you,” (Mosiah 4:8). In the following verses we are told what those conditions are to receive salvation and they are to believe in God and that he created ALL things, that we repent of our sins, humble ourselves before God, ask for a forgiveness of sins with a sincere heart and to believe. There is nothing in that chapter about temple ordinances, priesthood, tithing or any of the other things the Church says that we must do to be saved. Also, believing we will somehow achieve enough good works to qualify us for godhood someday is most definitely not humbling ourselves before God and retaining in remembrance our unworthiness and worthlessness as the book of Mosiah teaches us to do. The Book of Mosiah talks about the people following Christ and being called Christian, but there is no reason to believe that a people who lived over a hundred years before Jesus was even born would claim to follow him or call themselves Christians. Over and over the Book of Mormon claims these people were living the law of Moses but there is no evidence of that and instead they acted more like the followers of Jesus after his death and resurrection. Sure, the children of Israel believed there would be a messiah, but they believed he would be a warrior king who would overthrow the oppressive governments and bring political freedom and when people found out he was not what they thought he would be many stopped following him. There is absolutely no reason to believe that a break off group of Semitic people would be given more insight into the Messiah than the prophets and other writers of the Bible. In previous episode I mentioned some of the animals and plants that were out of place in the Americas in the time frame they were supposed to be in, and in Mosiah 7:22 it mentions barley which is another food crop that is out of place and I don’t think I mentioned it specifically, before. The thing about barley being mentioned in Mosiah chapter 7 is that it was supposedly around 124 BC and barley wasn’t even brought to the Americas until the early 1600s. In Mosiah 7:27 it says that Jesus is God, the father of all things and that he should take upon himself flesh, which sounds a lot like the trinity to me. This verse doesn’t say that Jesus is the son of the father of all things but that he is God and the father of all things. This section of The Book of Mormon talks about the Jaradite plates that were later translated by Mormon to become the book of Ether and it tells us how they became part of the story. Around 121 B.C. a man named Ammon was sent by king Mosiah to find a group of people that left years previous in hopes of finding their ancestral land where father Lehi lived. When Ammon found the people of Limhi they recounted to him the story of their discover of a destroyed people, later learned to be the Jaradites, while trying to find their way back to Zarahemla. When the people of Limhi accidentally found the area where the Jaradites lived and were destroyed they found cities, tools, weapons, armor, pottery, written records, coins and all of the things you would expect to find after the destruction of a civilized people, especially when the destruction occurred over a relatively small period of time. I think Joseph Smith knew that there is always evidence left behind when a civilization is destroyed and he wanted to make the story of the Jaradites more believable. When the Europeans came to the Americas the vast majority of the native people died from illnesses the Europeans brought with them. Since the Natives had never before encountered these illnesses their immune systems were not equipped to handle them and the death toll was significant. Of course, at the time germ theory had not been discovered yet and most of the people in the 1800s had no idea why there were so many mass graves and made up their own stories as to how it happened. One of the popular theories was that they destroyed each other in massive battles, despite the fact that there was no evidence to support there being large scale battles. I am sure Joseph Smith assumed that there were massive cities and destroyed civilizations we had not found yet and thought that at some point there would be evidence found that would support his claims of the ancient people of America. Because Smith was uneducated on the matter, he had no idea how the ancient people in the American continents lived and probably never thought his claims about the ancient inhabitants of America would expose his con. When a civilization is destroyed we find evidence of that civilization, and Smith knew that and that is why Mosiah talks about the people of Limhi finding the fallen civilization of the Jaradites, a people who supposedly left the holy land and headed to the Americas in submersible barges around the time of the Tower of Babel (approximately 2200 BC). The Jaradite barges is an extremely interesting topic that makes so little sense on so many levels, and while I am excited to talk about it, I will wait until I reach that point in the timeline, which will be when I get to the book of Ether. at Hill Cumorah, NY where the gold plates were buried and the last battle took place. In the last battle between the Nephites and Lamanites it is taught that millions of people died, yet no one has ever found any evidence of Nephite weapons, tools, coinage, records, art or cities. All throughout The Book of Mormon we read about massive battles where so many died that they could not be counted. The last battle, which Moroni records as happening near the Hill Cumorah near Palmyra, NY, which is where he buried the golden plates for Smith to find, supposedly saw the death of millions of people with no one left to bury the dead. With destruction on that scale we would expect to find massive graves and weapons of war, but none have ever been found. Some Mormon apologist argue that it happened so long ago that the evidence has been destroyed, but we have found the battle sites that have been written about in other literature that happened much farther back than the last battle between the Nephites and Lamanites was claimed to have happened. Archeologist and other scientist have searched for ancient recorded battle areas and found them, some of which occurred between three and four thousand years ago. Keep in mind The Book of Mormon records the last battle between the Nephites and Laminates occurring approximately 421 A.D. In Mosiah 8:11 it mentions the people of Limhi finding Jaradites swords that had rusted away. The problem with this is the Jaradite civilization stretched from 2200 Bc to 600 BC, and the Iron Age did not even start until around 4000 BC, and steel was not invented until the 17th century, so there was no way these people could have learned the art of iron and steel smelting before they left the holy land as it had not been discovered yet, and if such a large civilization discovered it on their own, especially if the Nephites also worked in metal, some evidence of it would have been found. There is zero evidence for steel or iron smelting or use in the Americas before the Europeans came. The Book of Mormon would have us believe that an ancient people discovered technology long before anyone else in the world did and that they were destroyed in a series of major wars leaving no trace of either their vast civilization and their cities or any of their technology. There is more evidence to support a mass government conspiracy to hide the existence of extra terrestrials than there is to support an ancient coin using, city building and metal smelting people in America. I mentioned it in earlier episodes, but The Book of Mormon does not have a very charitable opinion of the Native Americans who are supposed descended from The Book of Mormon people. They are often described as a wild, ferocious and blood thirsty people, a people who are lazy and idolatrous and indulge in all manner of wanton sin. No wonder the Church has not had much success converting the Native Americans. Chapters nine and ten of Mosiah talks about the many tens of thousands slain in battle, and elsewhere in the book it talks of millions who have died in battle, and as I mentioned earlier, we have not discovered one single mass grave anywhere in any of the American continents that would lend credibility to any of these stories. Yes, we have found some mass graves of the Natives who died after the Europeans got them sick, but not mass graves from battle, and no mass graves that would dated back to The Book of Mormon times. Even though Mosiah 11:2 is about the wicked king Noah I think Joseph Smith unknowingly wrote it about himself. Also, this is another instance where The Book of Mormon takes a hard pass on polygamy. “For behold, he did not keep the commandments of God, but he did walk after the desires of his own heart. And he had many wives and concubines. And he did cause his people to commit sin, and do that which was abominable in the sight of the Lord. Yea, and they did commit whoredoms and all manner of wickedness.” If you recall from reading The Book of Mormon of from earlier episodes, the book of Jacob condemns the practice of having more than one wife. In the book of Mosiah there is a prophet named Abinadi and he has to run and go into hiding because the king wants to kill him, and later he comes back to the city wearing a disguise so they won’t know who he is and won’t kill him, but then he immediately tells everyone who he is, so there was no reason for the disguise in the first place. This part of the story never made any sense to me. That would make as much sense as a person running from the cops to wear a disguise so they would not be recognized and then turn himself or herself in. In Mosiah 12:26 Abinadi says “I say unto you, wo be unto you for perverting the ways of the Lord! For if ye understand these things ye have not taught them; therefore, ye have perverted the ways of the Lord.” The LDS Church says that they know the Bible yet they teach doctrine contrary to the Bible; doctrine that is not only not Christian but is also blasphemous. Mosiah 13:34 is one of the many verses in The Book of Mormon that support the trinity instead of the current LDS doctrine of plural gods. “Have they not said that God himself should come down among the children of men, and take upon him the form of man, and go forth in mighty power upon the face of the earth?” Notice that Abinadi did not say that one of the gods would come down and take the form of a man, nor did he say that a god would come down and show man that God is a man like us, but he said that God himself will come down in the form of a man. The first five verses of chapter 15 also support the trinity, making it extremely obvious that when The Book of Mormon was written Joseph Smith had not yet concocted the idea of there being more than one God. Mosiah 15:26-27 spells it out clearly that when we die in our sins we have no chance of salvation, which does not support the idea of proxy work for the dead, one of the three missions of the Church. The three missions of the Mormon Church are to proclaim the gospel (or at least their version of it), to perfect the saints and to redeem the dead. Therefore ought ye not to tremble? For salvation cometh to none such; for the Lord hath redeemed none such; yea, neither can the Lord redeem such; for he cannot deny himself; for he cannot deny justice when it has its claim, (Mosiah 15:26-27). Mosiah 16:15 is yet another of the many verses that supports the Bible in there being only one God and that Jesus is God and not merely a god. “Teach them that redemption cometh through Christ the Lord, who is the very Eternal Father. Amen.” It is clear from this and other verses that Jesus is not only our savior but he is God and that there is only one God. Compare the verse above from The Book of Mormon to the official wording for the baptismal prayer found in Doctrine and Covenants 20:73. “Having been commissioned of Jesus Christ, I baptize you in the name of the Father, and of the Son, and of the Holy Ghost. Amen.” I will mention in in depth when I get to it, but the wording for the sacramental prayers differ in The Book of Mormon from the official wording in the Doctrine and Covenants as well. Mosiah 18:17 says that the church was called “The Church of Christ” but as I pointed out before, I have a difficult time believing that any Semitic people, or any people for that matter, would call their church “The Church of Christ” nearly one hundred and fifty years before Jesus was even born. As I have mentioned before, treating the law of Moses as if it had already been fulfilled before it was fulfilled would be a great sin. Also, there is no evidence whatsoever that anyone was baptized before the coming of Jesus. The closest thing to baptism that was around before Jesus was the ritual washings people had to do to be ceremonially clean, and it was a private activity that had absolutely nothing to do with baptism and did not require a priest or anyone else. In Mosiah 18:24 and 26 it talks about church leaders supporting themselves and the LDS Church likes to brag that they have no paid ministry, but that is not exactly true. Sure, the multitudes of ward and stake leaders serve for free, but those in the higher positions in the church get paid, including mission presidents, those in the quorum of the seventy, area authorities, apostles and the first presidency. Joseph Smith also insisted that the church support him and some early members accused him of “priestcraft” and almost left the church. The God of The Book of Mormon made salvation simple and, more often than not, agreed with the Bible, instead of the convoluted and impossible obstacle course that the LDS Church says you must traverse to be saved. “For behold, this is my church; whosoever is baptized shall be baptized unto repentance. And whomsoever ye receive shall believe in my name; and him will I freely forgive,” (Mosiah 26:22). Since the time this passage was written the Church has come up with all sorts of conditions and addendum that must be adhered to in order to be saved or exalted. The LDS Church teaches that basically everyone will be saved and will go to some degree of glory and that salvation is not what we should strive for but exaltation and becoming a god. I think it is important to mention that nowhere in The Book of Mormon does it support the idea of exaltation or becoming a god but takes the more of the Biblical view of salvation where when we are saved we serve and worship God for eternity with no goal of or chance at becoming more than that. We are just lucky to be saved and are only saved because of the grace of God. In the twenty seventh chapter of Mosiah there is a story about Alma the younger and the sons of Mosiah and their conversion, which is basically a lazy attempt to plagiarize the story of Saul on the road to Damascus. Alma the younger and the sons of Mosiah are persecuting the church and committing all sorts of sin, but they are visited by an angel who asks why they are persecuting God and his church. The meeting leaves Alma ill and unconscious for several days. When Alma comes out of it he devotes his life to spreading the gospel, but not to his own people but to the Lamenites. 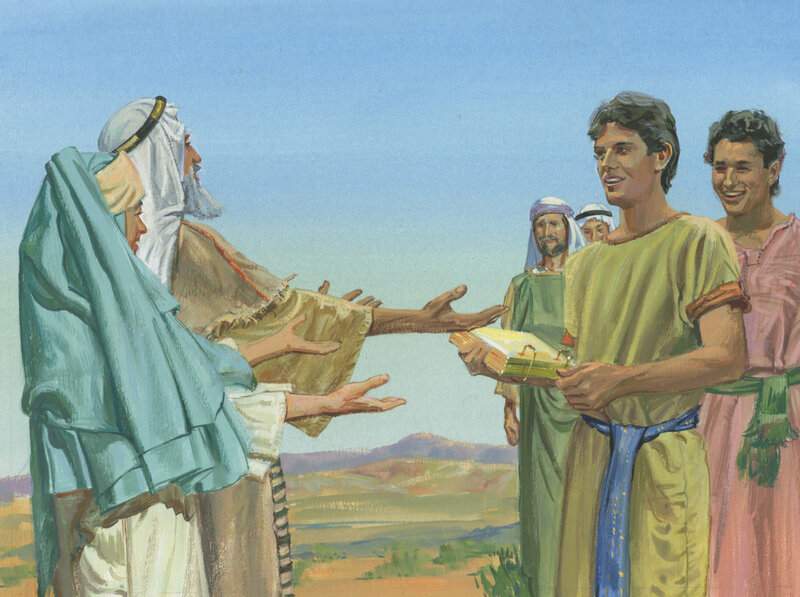 The sons of Mosiah also give up wealth and power to preach to the Lamanites and Mosiah 28:4 talks of the way Alma and his companions were before the angel visited them and refers to them as “the very vilest of sinners.” Compare that to what Paul (formerly Saul) says in 1 Timothy 1:15, “Christ Jesus came into the world to save sinners--of whom I am the worst.” A person would have to intentionally ignore the similarities to not know this is a cheap rip off of the conversion of Saul and his subsequent ministry to the gentiles. When Alma comes out of his angel induced coma he says that he is born of the spirit (Mosiah 27:25), but as I have mentioned in previous episodes, no one was born of the spirit until after the death and resurrection of Jesus, and Jesus even said that if he did not leave than the spirit would not come (John 16:7). Mosiah 27:25 says that everyone must be born again, which is interesting because not only does no one in the Mormon Church talk about being born again, but the term “born again” is treated like it is a bad word. When a Mormon meets a person who says they are born again they look at them as if they had just said they sold their soul to the devil and now eat babies. When I had only been a member of the Church for a few months I put a sticker on the back of my car that said something about being born again and someone in my ward removed the sticker from my car without even asking my permission. I was later told the sticker was removed for my own good. I had a t-shirt that had a cross on it as well as some Bible verses and my girlfriend secretly threw it away. When I confronted her about it she said she did not want me to wear the shirt because it make me look like a born again Christian. When I pointed out to her that The Book of Mormon says that we must be born again she got mad and slapped me. The Book of Mormon is what the church uses to get people into the church because without it there would be no church, and because it agrees with the Bible more than it agrees with the LDS doctrine and makes the church look a little more Christian. There is almost no Mormonism within the pages of The Book of Mormon. I am convinced that if the missionaries were to try to peddle the Pearl of Great Price or the Doctrine and Covenants the way they peddle The Book of Mormon that no one would ever join the church. On my mission we were specifically instructed to keep the investigators from learning the more unorthodox doctrines until after they had already decided the church is true, and I am sure that is common practice in all missions. Even after joining the church it is sometimes years before some doctrines are learned, and some people belong to the church their entire life without ever knowing what the church actually believes because they never investigate farther than what they learn in Sunday School. I hope this has been educational or at least entertaining. The next section on The Book of Mormon will be about the book of Alma, but because the book is so large I will have to dedicate more than one episode to it.